It all began about 3 weeks before when Mrs R-T forwarded on an email that Blacklock was opening a branch in the city, sadly we were unable to make it as she was in Iceland and someone suggested it may be unfair to go without her! Fast forward a week and Mr R having stumbled over said email and salivating over the thought of meat on meat, decided to give them a call and did something we NEVER do, he dropped the “my wife is a food blogger” line. The nice people agreed to honour the discount. So we got to the day and were figuring out plans and for some reason, Mr R assumed it was the Soho branch we were heading to. Luckily the reconfirmation phone call cleared that up and a few hours later we arrived at Blacklock City for our meal. Mr T arrived first and the perks of “dining with a blogger” kicked in when he was shown to the bar as his table wasn’t ready and then was quickly reproached and told that if he wished to be shown to his table they could definitely find one for him. Anyway, he hung at the bar and when we arrived we ordered a round of drinks before being taken to our table. Upon arriving at our table, we were given menus and our super friendly waitress said a quick hi and that she’d be with us in 5 minutes. 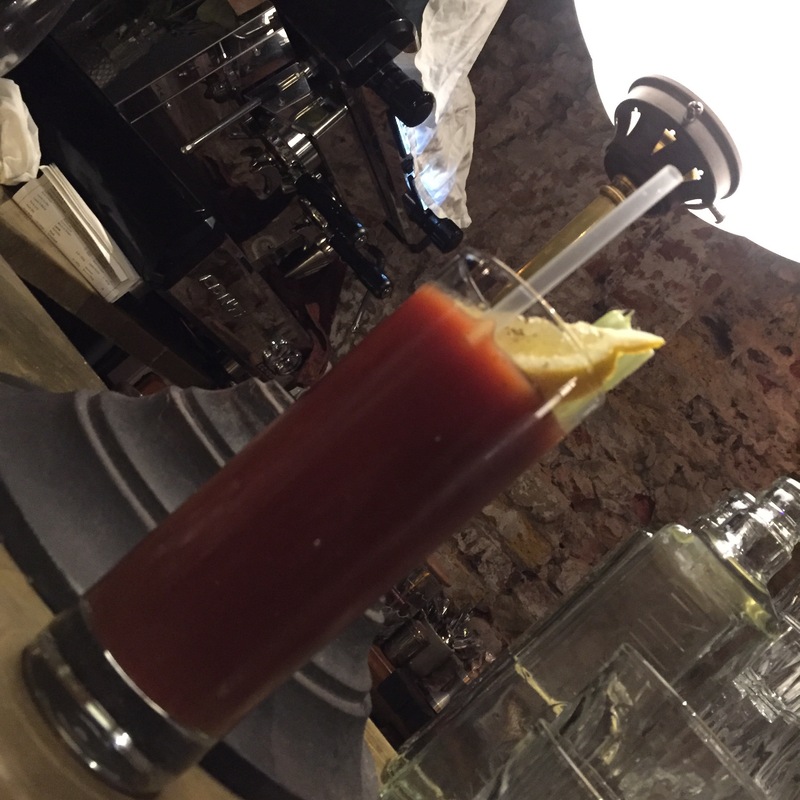 When she did come over, she sat in the spare seat (Mrs R-T was a little delayed) and chatted us through the menu, suggesting what was great and not so great – absolutely loved her honesty and openness! We started by ordering 2 each of the pigs head (after confirming that they were akin to pulled pork) and also the lamb ribs. Despite the slightly unfamiliar texture, the pigs head was pretty darn good. There was a rather distinct smokey flavour and a slight zing from the chillies. The gravy, however, could have done with a little more flavour. These were in fact even better than the pigs head. The meat was so unbelievably tender it was falling off the bone and whatever the marinade/sauce was, was delicious! We decided the best way to tackle the rest of the menu was to go with 3 “All In” options which consisted of some pre-chop bites, all of the day’s skinny chops, piled on coal flatbread to share with a side each. So first up was the pre-chop bites, akin to a palate cleanser. Honestly, palate cleanser or not, these simply left a bad taste in our mouths. I tried the chicken and horseradish and had to retrieve a stray bit of chicken cartilage from my mouth, this simply put me off trying any of the others. Mr and Mrs T and Mr R were equally unimpressed. However, to turn a negative into a positive, our distaste for the pre-chop bites left us with ample space for the main event, let me introduce to you the place of meat we received. Despite our waitress going through them, a combination of the dim lighting, the similar colours and our eagerness to tuck in, it still ended up being a lucky dip, none of us knowing if we were eating lamb, beef or pork. The meats (regardless of what they were) were well cooked. The flavour natural and good, however, the sauces simply added to the overall experience (see below), the Garlic Marrow Spread being our personal favourite (I hope I’ve tagged them the right way round!). Because we were all super hungry when we sat down, we went slightly ott and also decided to try the Rump Cap. This was also super tender and very well cooked. Along with out “All In” option, we also picked 3 sides – the 10 Hour Ash Roasted Sweet Potato; the Kale & Parmesan and the Beef Dripping Chips. The sweet potato was amazing. The flesh was so soft, it was almost buttery sweet and the ash had left a depth of flavour along with the scattering of oregano finishing this off perfectly. The Kale and Parmesan was equally good having been liberally coated with some kind of parmesany mayo mix. The chips were pretty average. Having demolished a decent amount of meat, the question of dessert came up. 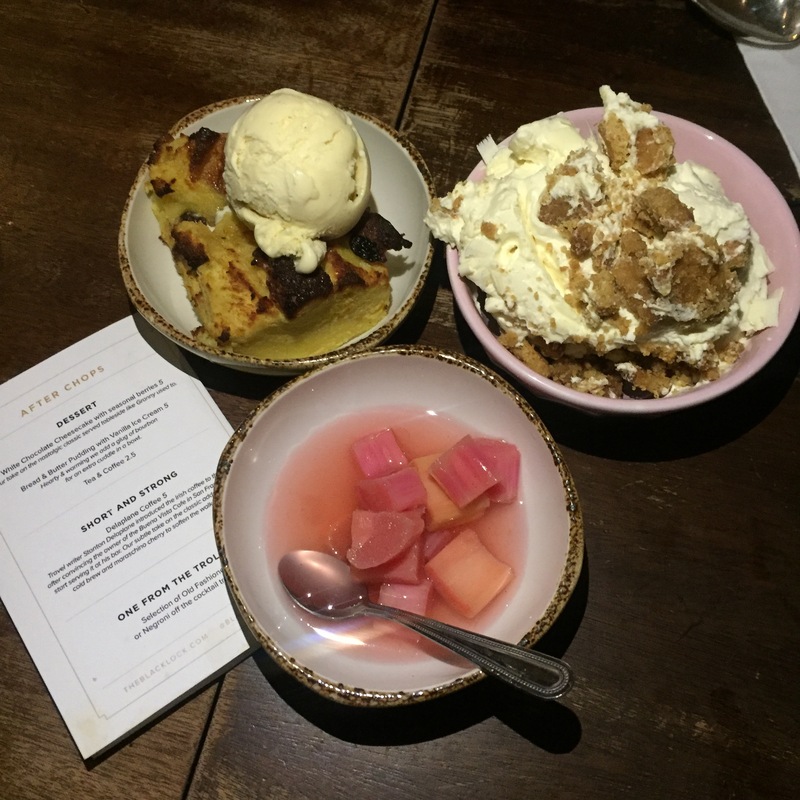 Obviously, we managed to clear some space and ordered one each of the two desserts on the menu. Given that Mr T’s birthday had just passed and Mr R’s birthday was next up, Mrs R-T decided it would be fun to tell our waitress. Lo and behold, our desserts arrived with a group of singing restaurant staff. Once the singing was over we tucked in. The White Chocolate Cheesecake with Seasonal Berries (rhubarb!) was like a deconstructed, creamy, chocolatey, biscuity mess, but my gosh was it moreish. The white chocolate’s sweetness was cut by the creaminess and the biscuits ensured that the dish had some texture running through it. The bread and butter pudding was equally good hitting both the soft inside and crispy top criteria on the head. Whilst I don’t usually highlight the fact that I’m a blogger to restaurants when visiting, my cover was blown this time by Mr R. As an outcome, they had obviously taken special care to hand pick the friendliest waitress in the house for us as the service we received was fantastic (she even hugged each of us on the way out so it ended up feeling like you were leaving a friend’s place after a dinner party!). That said, the food was good, with some dishes clearly more flavourful than others and the All In menu was extremely meaty and generous for the rather affordable £20. 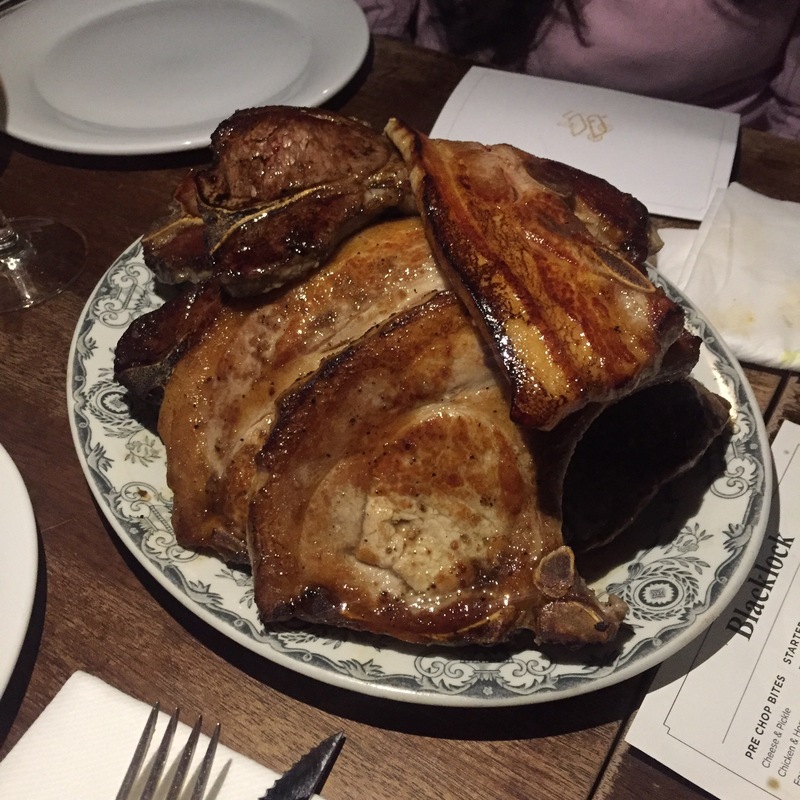 I’d have to have been veg for at least a week before visiting Blacklock again, but I’d happily recommend it to anyone looking for a meat feast.